Terence R. Flotte M.D. Editor-in-Chief Human Gene Therapy, Mary Ann Lieber, Inc.
Twenty-seven years after Steven A. Rosenberg, M.D., Ph.D., at the National Cancer Institute Bethesda campus performed the first human gene transfer experiment, gene therapy is poised to take its place in the armamentarium of biologic therapies available to treat human diseases. These two rAAV products emerging onto the market represent only the first trickle of what promises to be a gusher of new gene therapy products moving into the world of clinical medicine in the coming years. Several other remarkable examples of clinical efficacy from gene therapy have been reported. These include results of rAAV trials of products for hemophilia A and B and spinal muscular atrophy as well as trials of lentivirus-modified chimeric antigen receptor T cells (CAR-T) cells for a variety of cancers, most notably the anti-CD19 CAR-T therapy for leukemia. Additional gammaretrovirus and lentivirus-based approaches to treat diseases affecting hematopoietic stem cells, such as X-SCID, ADA-SCID, WAS, and MLD have shown impressive clinical efficacy. In addition, a myriad of gene therapy approaches are making their way through preclinical and clinical proof-of-concept studies. These include rAAV-based gene therapies for other single gene disorders affecting the retina, the CNS, skeletal muscle, and liver. Also, the vector-mediated delivery of specific antibodies as a potential therapy or prophylaxis has emerged in the treatment of infectious diseases such as influenza and HIV. The most impressive aspect of gene therapy in 2016, however, is the broad array of new research activity further up the pipeline, in terms of both new platform technologies for gene modification and new proof-of-concept studies on how those platform technologies can be deployed to fight specific human diseases. Since the dawn of gene therapy, when the Nobel-recognized work of Varmus and Bishop on how gammaretroviruses mediate tumorigenesis led to the first recombinant viral vectors, the scientific discoveries underpinning gene therapy have come from unexpected quarters. S. pyogenes, and ongoing discoveries about the co-evolution between mammals and their viruses extending the pioneering work of Varmus, Bishop, and their colleagues. The discovery of RNAi mentioned above represented a paradigm shift for gene therapy because it allowed, for the first time, for truly robust, genetically targeted down-regulation of gene expression, which is crucial for the treatment of dominant genetic disorders and other conditions where disease is caused by over-activity of a detrimental gene product rather than by deficiency of a salutary one. Previous approaches, such as anti-sense oligo-deoxynucleotides (AS-ODN) and ribozymes, could, in principle, down-regulate genes by targeting specific sequences, but the efficiency of such systems was not high enough to allow for reliable translation beyond the tissue culture setting. RNAi, in contrast, was the first mechanism that combined nucleotide sequence-based specificity with a robust enzymatic activity, in this case the RNA-induced silencing complex (RISC)-complex. That combination of sequence-based targeting with enzymatic power turns out to be the key combination for all the systems that “work” in the sense of being efficient enough to achieve clinical results, once the inherent limitations of delivery technology come into play. The first iteration of such therapies to achieve clinical efficacy is small-interfering RNA (si-RNA), a technology for double-stranded RNA oligonucleotides that harnesses the RNAi pathway to down-regulate offending genes. Gal-Nac conjugates of siRNA have been pioneered by Alnylam Pharmaceuticals as a means to deliver any desired siRNA sequence to hepatocytes (Figure 1). This has been used as a therapy for transthyretin (TTR)-mediated amyloidosis, complement-mediated diseases, and other genetic and acquired conditions in which gene knockdown within hepatocytes can interrupt the pathogenesis of the disease. Another technique for harnessing the RNAi pathway that may be more suitable for long-term knockdown in autosomal dominant genetic disorders is long-term expression of synthetic miRNA. The discovery of miRNA in C. elegans by Ambros and Ruvkun actually preceded that of exogenous RNA-mediated down-regulation by Fire and Mello. The discovery that both modalities utilize the same enzymatic pathway has led to a breakthrough understanding of the natural role of miRNA in mammalian systems and to a new approach of using rAAV vectors to deliver synthetic miRNA “genes” capable of continually expressing miRNA with a sequence specificity tailored to a particular gene target. This has recently allowed for allele-specific augmentation and knockdown, meaning that a normal version of a gene can be expressed simultaneously with a miRNA designed to knock down the offending mutant version. One example of this approach was recently demonstrated for alpha-1 antitrypsin deficiency (AATD) in which liver disease is caused by a toxic gain of function of the mutant protein while lung disease is caused by the lack of the normal transgene product in the circulation. The ability to “fix” offending genes (rather than augmenting expression from adding additional gene copies or blocking expression of endogenous genes with the RNAi pathway) remains the holy grail of genetic approaches to therapy. While some early efforts at homologous recombination showed promise ex vivo in select circumstances, the true breakthrough in genome editing came with the discovery of the CRISPR/Cas9 as a host-defense pathway in bacteria such as S. pyogenes, S. aureus, and N. meningitides. As with RNAi, the key to its success is the combination of sequence-specificity of targeting with the amplified efficiency of an enzymatic mechanism. This system has been harnessed in the form of a readily available technology platform in which delivery of a synthetic short-guide RNA (sgRNA) is combined with delivery of a Cas-like enzyme, allowing for the efficient creation of double-strand breaks (DSB) in the gene of interest (Figure 2). If the desire is simply to knock out the gene, host DNA repair mechanisms will generally repair the DSB with the loss or addition of two to six nucleotides resulting in a small insertion and/or deletion (indel), which will then lead to a frame-shift and termination. 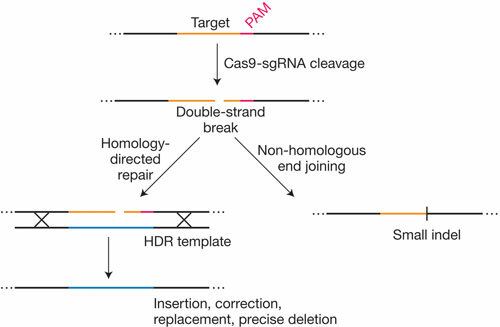 If the desire is to actually repair the gene of interest, a ds-DNA template for homology-dependent recombination (HDR) is also supplied along with the sgRNA and the Cas enzyme. The creation of DSBs greatly enhances the efficiency of HDR at the locus and a remarkably high number of recombination events produce intended final sequence. The application of this technology to the treatment of human disease is in its infancy. Specific therapeutic approaches have been demonstrated for genetic diseases of the liver such as hereditary tyrosinemia due to FAH deficiency. The ability to efficiently deliver all needed components simultaneously and to limit the location and duration of the DNA editing activity remain challenges, but the potential of this therapeutic approach is clearly enormous. Figure 2. Genome Editing with CRISPR/Cas9 Sontheimer, E.J. and R. Barrangou, The Bacterial Origins of the CRISPR Genome-Editing Revolution. Hum Gene Ther, 2015. 26(7): p. 413-24. Viruses remain the ultimate gene transfer machines of nature. Evolved for countless millennia along with their hosts, particularly mammals such as humans, viruses have natural means to insert genes into host cells, in most cases with the intent of allowing those host cells to survive long enough to propagate both virus and host. AAVs are undoubtedly the simplest and arguably the most elegant viral co-travellers that humans possess. At times described as “Almost A Virus” and “An Amazing Virus”, the simplicity and ubiquity of AAVs in humans form a logical basis for understanding why this platform has been the first to achieve successful licensure in Europe and is likely to do so this year in the U.S. The explosion of applications of rAAV in human diseases has been exceeded by the explosion of new AAVs that have been discovered as potential platforms for the delivery of genes, synthetic miRNAs and CRISPR/Cas9-related systems. Beginning with the pioneering work of Gao and Wilson, AAV has come to be understood as an incredibly diverse set of viruses in humans and other mammals. There is strong evidence for ancient AAVs that have co-evolved with humans and retain the ability to transfer genes and have them persist for life, causing minimal damage to the host. The improved understanding of AAV structure, function, and evolution may prove to be a rich treasure trove of tools for gene transfer going forward for the remainder of the 21st century. Terence R. Flotte, M.D. (Terry.Flotte@umassmed.edu), is the Celia and Isaac Haidak Professor in Medical Education, dean of the School of Medicine, provost, executive deputy chancellor, faculty member at the Horae Gene Therapy Center, and professor of pediatrics the University of Massachusetts Medical School. He is also the editor-in-chief of Human Gene Therapy, published by Mary Ann Liebert.